Modern, cozy and providing details that fill every corner with character and soul: this is what the junior suites at the Hotel Vincci Soho are all about. These rooms will let you rest and breathe and at the same time they provide you with a unique experience. They all offer maximum comfort and complete four-star service — from the private bathroom filled with all kinds of details to a TV with pay channels, internet, separate spaces, safe, minibar and special service. 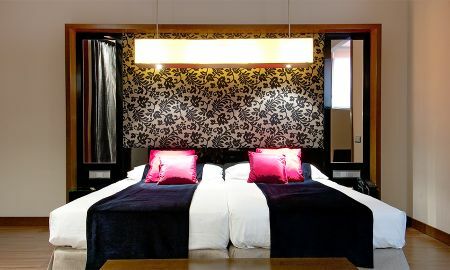 Vincci Soho is one of the most popular hotels in the historic center of Madrid. Its modern and original design charms the most demanding travelers and promises an exceptional stay. 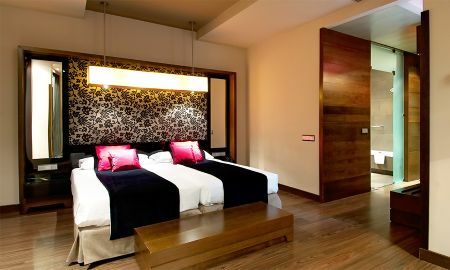 The Vincci Soho hotel has 169 rooms with modern facilities, decorated in red and black tones. 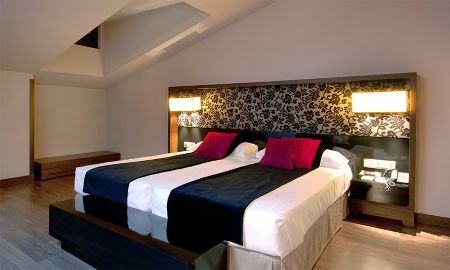 All rooms are spacious, bright and very original, which guarantees an unforgettable experience. Free Wi-Fi is available in all areas of the hotel. Every morning, guests can enjoy a hearty breakfast buffet, which is suitable for celiac consumers. The hotel is also home to one of Madrid's most renowned restaurants for its Mediterranean cuisine. During the summer season, the hotel terrace is ideal for enjoying a delicious snack in a casual atmosphere. The Vincci Soho hotel has 6 meeting rooms ideal for hosting conferences and private events. A team will be at your disposal to accompany and advise you. Hotel Vincci Soho is located in the heart of the Las Letras neighborhood, close to the Art Triangle, Madrid's main museums, Plaza de Santa Ana, Puerta del Sol and Plaza Mayor. The Opera and the Royal Palace are a short walk from the hotel, while restaurants and bars are just 100 meters away. Antón Martín Metro Station is 300 meters away and Adolfo Suárez Madrid-Baraja Airport is 20 minutes from the property.